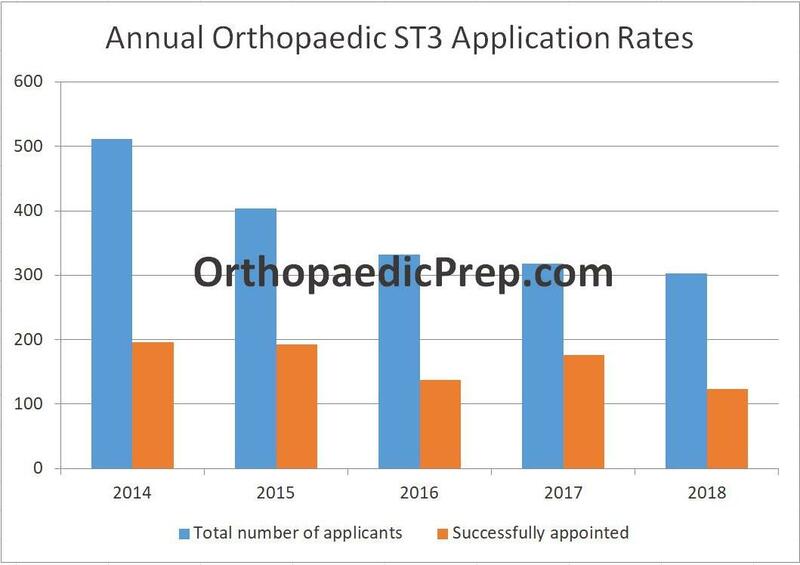 In 2018 the competition ratio for UK ST3 jobs in Orthopaedics was 2.4:1. This means that for every 2.4 applicants, 1 was successfully appointed to a registrar post. 89% of those that applied were invited to interview and 46% of those interviewed were successfully appointed. See the table below for previous years competition ratios. There are between 100 and 200 Trauma and Orthopaedic Registrar Training Posts or National Training Numbers (NTNs) available each year (colloquially referred to as ‘numbers’). These jobs are divided up according to deaneries. This number can change considerably each year. Below summarises the competition ratios for registrar jobs over the last few years. The graph below shows the annual change in applicant numbers and those successfully appointed after interview. Most successful applicants have between 21 and 25 months experience of orthopaedics (excluding foundation training). Broad age range but average age for those being offered jobs is 29. Roughly a quarter of the candidates attending interview each year are currently core surgical trainees with the vast majority of the rest having already completed CST – however those in a CST post at the time of interview tends to do better than other applicants with between 50 and 70% successfully being offered jobs. Core surgical trainees from London and Oxford have the highest success rates when attending interview (75-80%). Most candidates rank London or Oxford as their top preference and so competition for these posts is fiercest with West Midlands and Severn not far behind.